The humble GIF: lifeblood of Reddit, cat pictures' next evolutionary step, and the only way to watch professional basketball. (Seriously, try it: Watch two or three dunks, a funny reaction shot, and James Harden stroking his magnificent beard, and you've gotten the maximum possible amount of enjoyment out of an NBA game and saved yourself about three hours.) While the GIF was created in the mid-'80s, only in recent years has it been wholeheartedly embraced by the Internet, replacing Simpsons quotes as the dominant means of communication online. But designer Jiho Jang wants to take this old/new technology back to the past. All the way back to sixth grade. 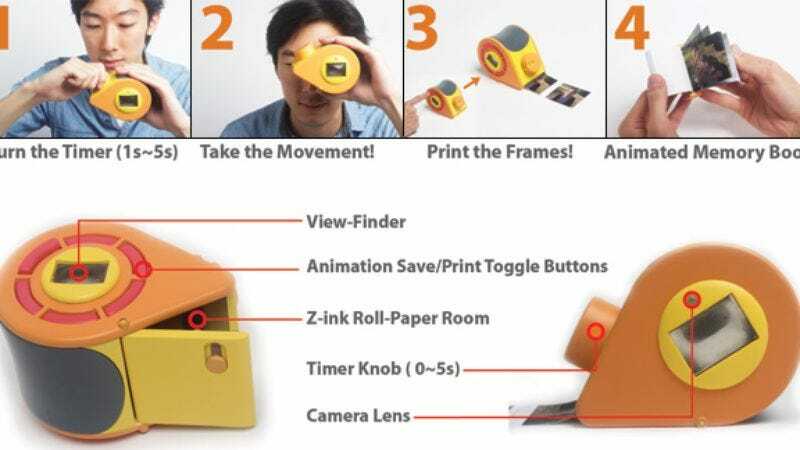 Jang has invented the GIF-TY; a combination digital camera and printer, which captures a GIF animation, then prints it as a flip book. After decades of bored middle schoolers hand-drawing flip books in looseleaf notebooks, usually of stick figures murdering each other, the middle schoolers of tomorrow will be able to film their friends murdering each other (assuming the quality of America's schools continues to decline), and have a cute, retro memento of the experience. Cat owners making analog GIFs of their nauseating pets will be able to embrace the now-ancient custom of showing people things in person instead of taking pictures of stuff and posting it on Facebook.